When an equipment’s durability reaches 0, it is outworn. An outworn equipment can either no longer give bonuses, automatically be unequipped or destroyed. The durability of equipment can be changed using the Event System – e.g. reducing a weapons durability each time it’s used in a physical attack. The durability settings are individual for each equipment level. In this tutorial, we’ll enable durability for the Short Sword, add durability display to the equipment menu screen and update the attack battle events to wear off the weapon’s durability. Let’s get to it! Open the ORK Framework editor and navigate to Inventory > Weapons. Select the Short Sword and change the following settings. The weapon wont give any bonuses when the durability reaches 0. That’s it for the weapon – it’ll now have a durability of 100. Navigate to Menus > Menu Screens, select Equipment and change the following settings. While we’re updating the menu screen, let’s enable changing equipment using drag+drop. The HUD Info Display settings are used to add HUD elements to the choices of the menu. In an Equipment menu part, they can be used to display level points and durability information about the weapon or armor the choice represents. We’ll display a simple value bar representing the durability. The Parts info display will be used by the Equipment Parts box. Click on Add HUD Element to add an info element. The List info display will be used by the Equipment box. Now we’ll update the attack and attackNoCalculation battle events to decrease the durability. Navigate to Events and open the attack.asset battle event. Insert the new step after the Play Sound step when the attack hit the target. That’s it for the attack event – click on Save Event to save the changes. Now, open the attackNoCalculation.asset battle event. Here, we’ll add the new step after the Combatant Animation step. That’s it for the attackNoCalculation event – click on Save Event to save the changes. 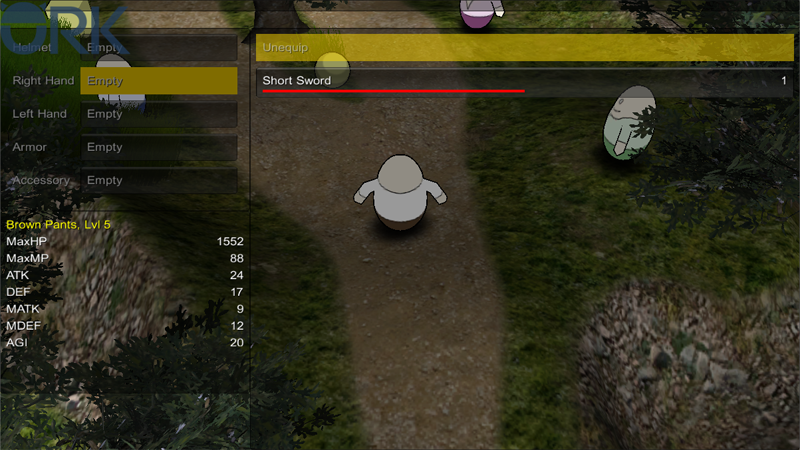 Now, you’ll see the Short Sword‘s durability in the equipment menu, and the durability will decrease when attacking. When adding equipment durability, you naturally also want to be able to repair the equipment when it’s broken or the durability is low. You can add this mechanic using the Event System, similar to reducing the durability. E.g. add an NPC that asks to repair your equipment (for a fee) – it’s just a series of dialogues, inventory checks and durability changes, and you’ve got yourself a brand new repair NPC.